The sophomore record is a big deal. It can either make or break you, especially following a No. 1 hit on you debut (the Josh Joplin Group experienced a hit with "Camera One" on their debut, Useful Music). 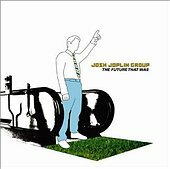 Fortunately for the Josh Joplin Group, The Future That Was, their sophomore full-length, shares the same fairly bland, but catchy-as-all-get-out pop-rock with clean production, perfectly flawless vocals, and harmonious backing vocals. The Future That Was has thirteen songs that match the hook-laden addictive-ness and lyrical smarts of "Camera One", with Josh Joplin's voice, the focal point of the music, with everything mixed to compliment and not overpower it. From the sparse "Dishes" to the acoustic-led bounce of "(I Am Not The Only) Cowboy" through the piano of "Listening", the Josh Joplin Group writes some pretty pop songs that are supplemented (or maybe complimented) by the generic, feeling-deprived, but ultra-radio friendly pop rock. I'll give this a B-.